The iconic 6th Street Viaduct in LA is currently crumbling, but HNTB just won a competition to replace it with a spectacular new design. The ribbon bridge will offer more than just a way to cross over the 5, the 101 and the LA River - it will also serve as an important pedestrian link and provide lots of park space while incorporating public art and promoting sustainability. HNTB and team went up against heavy hitters AECOM and Parsons Brinckerhoff, but they were awarded first place last week by the City of Los Angeles for their impressive design, which is sure to become a new landmark for the city. HNTB collaborated with Michael Maltzan Architecture, AC Martin, and Hargreaves Associates to design the new bridge, which was inspired by the arches of its predecessor. Opened in 1932, the art deco 6th Street Viaduct was one of nine connections built over the LA River, but is now degrading and was deemed unfit for restoration. 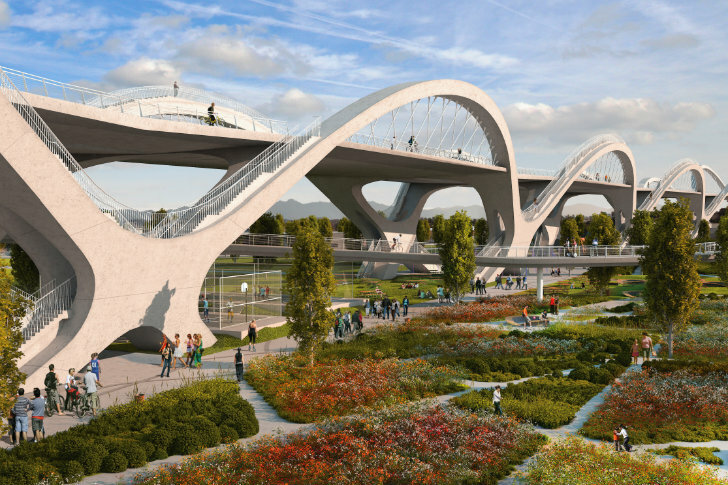 The new cable-stayed bridge will be constructed from ten sets of concrete arches that will connect Boyle Heights to the Arts District across I-5, the 101 and the LA River. Cars aren’t the only ones with access across, the bridge will also cater to pedestrians and bicyclists with dedicated lanes and paths. Stairs and access from the bridge down to street level, to parks underneath and even to the river will create a greater connectivity near downtown. Under the eastern section of the bridge will be the Boyle Heights Gateway, which will include playgrounds, sports facilities, a pedestrian promenade, a transit plaza, and a lookout point. It will also include an extension of the Clean Tech Corridor through the adaptive reuse of existing buildings to make way for new companies. On the western side will be a connection with the Arts District with a hardscaped Arts Plaza containing a café, outdoor seating, a lookout, and terraced riverbank hardscape. Slightly to the east is the Viaduct Park with a promenade, amphitheater, and skate park. And finally the bridge will provide easy access to the restored LA River below. Sustainability sits at the heart of the new project which will provide new public park space, improve biodiversity, renovate underutilized spaces and revitalize the area. The pedestrian and bike-friendly bridge will help decrease car activity and encourage use of public transportation. HNTB collaborated with Michael Maltzan Architecture, AC Martin, and Hargreaves Associates to design the new bridge, which was inspired by the old one with its arches. Opened in 1932, the art deco 6th Street Viaduct was one of nine connections built over the LA River, but now is quickly degrading and was deemed unfit for restoration. 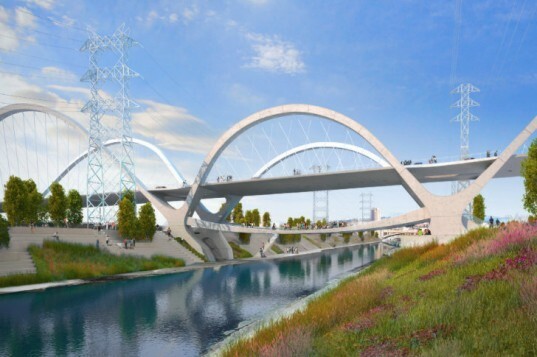 The new cable stayed bridge will be constructed from ten sets of concrete arches that will connect Boyle Heights to the Arts District across I-5, the 101 and the LA River. Cars aren't the only ones with access across, the bridge will also cater to pedestrians and bicyclists with dedicated lanes and paths. Stairs and access from the bridge down to street level, to parks underneath and even to the river will create a greater connectivity near downtown. Under the eastern section of the bridge will be the Boyle Heights Gateway, which will include playgrounds, sports facilities, a pedestrian promenade, a transit plaza, and a lookout point. It will also include an extension of the Clean Tech Corridor through the adaptive reuse of existing buildings to make way for new companies. On the western side will be a connection with the Arts District with a hard-scaped Arts Plaza containing a café, outdoor seating, a lookout, and terraced riverbank hardscape. Slightly to the east is the Viaduct Park with a promenade, amphitheater, and skate park. And finally the bridge will provide easy access to the restored LA River below. Overview of the bridge across the highways and the river. Sustainability sits at the heart of the new project which will provide new public park space, improve biodiversity, renovate underutilized spaces and revitalize the area. The pedestrian and bike-friendly bridge will help decrease car activity and encourage use of public transportation.